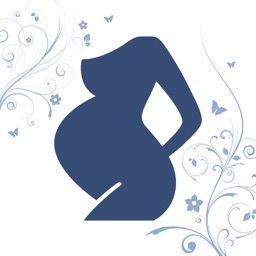 Christian Hypnobirthing is designed to bring you spiritual support and empowerment throughout your pregnancy and birth. 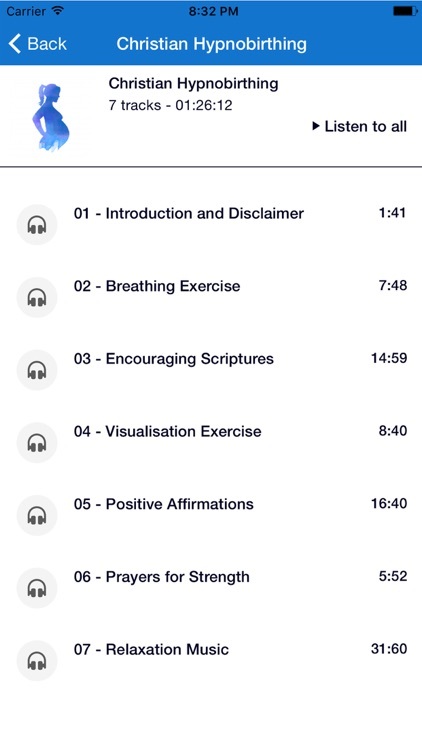 The first section ‘Listen’ is made up of seven audio tracks that include: prayers for strength, encouraging scriptures for birthing, breathing and visualisation exercises to help you relax, positive affirmations to keep your thoughts focused and confident, and relaxation music to underscore your own prayers or meditation. 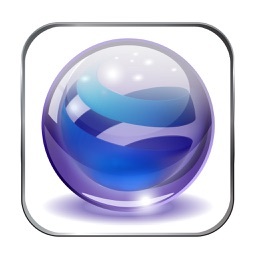 If you are planning on having your baby in a hospital or midwife led unit with no internet, we also provide a link (within the app) to download the tracks onto your computer, and load them into your own listening device. 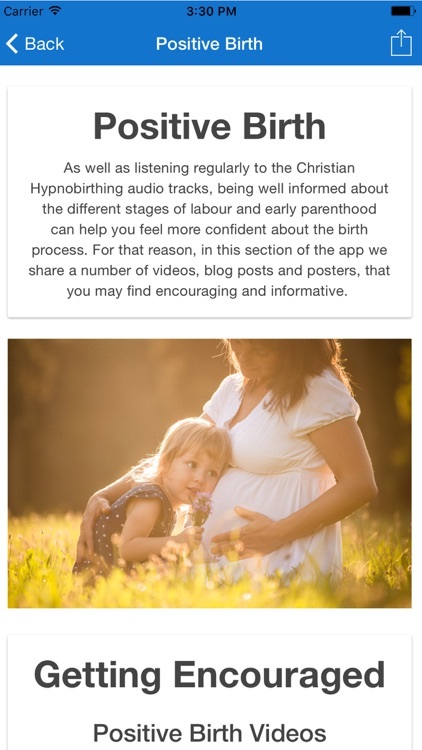 We recommend listening to Christian Hypnobirthing at least two to three times a week from 30 weeks, and as often as every day from 36 weeks. 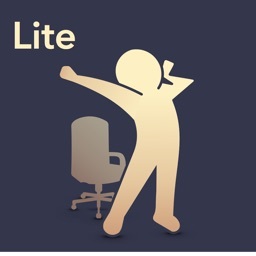 Don’t worry if you are further along, however, as there are benefits regardless of how many times you listen to it. One of the main causes of pain during childbirth is fear. Fear causes your body to release hormones that block endorphins, which are your body’s natural pain relievers. Fear can also cause your muscles to tense up, making the opening of the body in labour harder and therefore more painful. Being in a state of faith, love and strength can help you to overcome fear and as a result, birth can be a more satisfying, joyful and empowered experience. 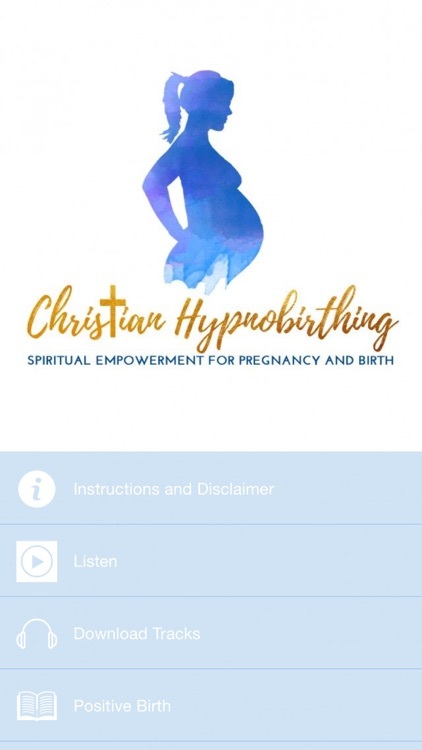 Listening to Christian Hypnobirthing can help you to come into this faith filled state, but also being well informed about the different stages of labour and early parenthood, can help you feel more prepared, confident and relaxed about the birthing process. 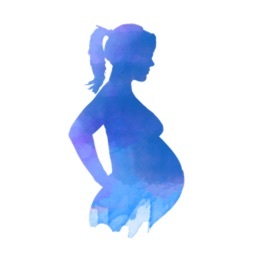 For this reason, in the 'Positive Birth' section, we share videos, blog posts, and more, that you may find encouraging and informative. 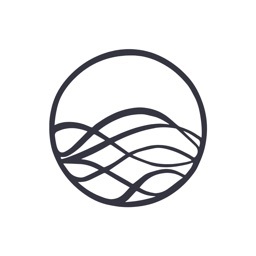 Combining relaxation techniques used in Hypnobirthing, with the huge power, strength and support that comes from our Heavenly Father, Lord Jesus and Holy Spirit, Christian Hypnobirthing aims to help you open to a more wonderful and spiritually empowered birth experience. 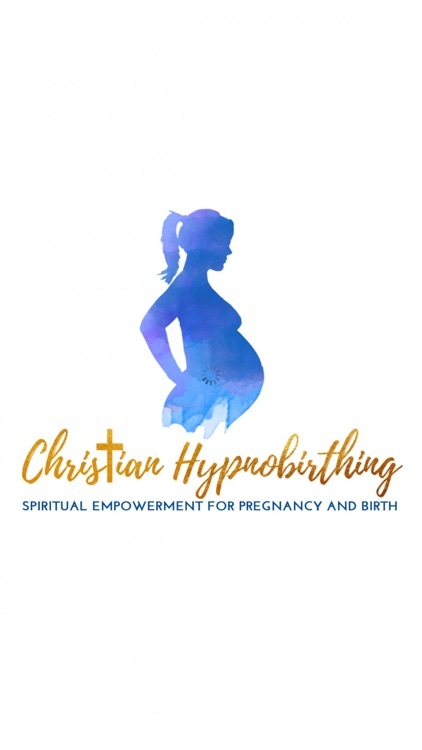 DISCLAIMER: Christian Hypnobirthing is designed to help support you in a more comfortable birth, however it is not a substitute for the advice or presence of a qualified medical practitioner, midwife or obstetrician. 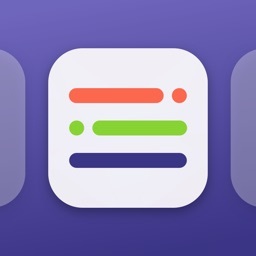 It does not represent an alternative to appropriate medical care or professional medical advice, in any way shape or form, so please consult your doctor or medical caregiver before using it.